Take a look at the side by side comparison. I ask you, truly... which looks better? I must say up front, I don't own an iPhone, but was looking for a deal. I won't be getting an iPhone now. I will not even consider it if I have to get IOS7. 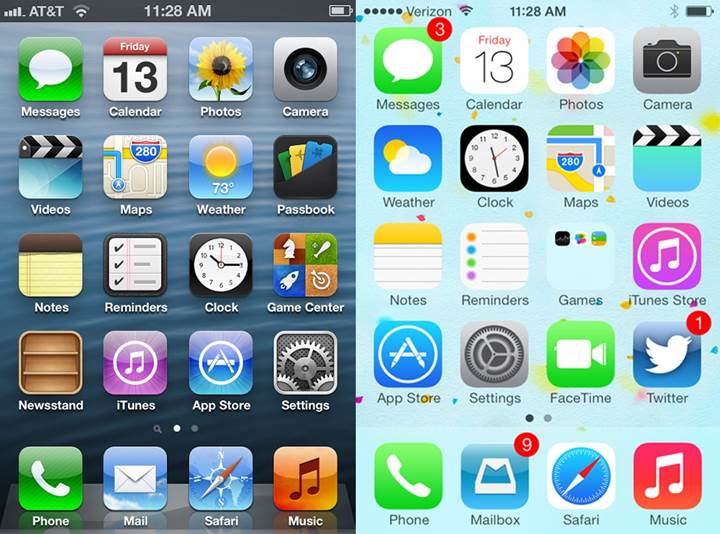 IOS6 had nice 3D shadows, and 3D icons. A great look and feel. That is all gone for speed I guess, ala Windows 8. Shame, of all the boneheaded things to do, NEVER follow behind Windows 8, and Microsoft's screw ups. It just goes to show that Apple without Jobs is DOOMED! Apple must be full of group think and a bunch of robots. I give them 5 years before the iTower starts to crumble. Jean - Pierre Houdin has discovered how the Great Pyramids were built. KHUFU's pyramid, which is the largest, was built from the inside out, using a 7 % ramp along the outer edges. Then a pulley system was used in the great center chamber, and evidence shows the theory to be correct. I myself have stated amongst friends that it is preposterous that slaves built the pyramids, this theory supports the idea that skilled dedicated workers actually were paid and hired to build the Pyramids. In the outer areas, well fed skeletal remains support my statement. The entire theory is brilliantly simple, and is easily acceptable as the true theory on how the Pyramids were built. Fascinating!